Linwood's Interior Design brings over 30 years of experience right to your home or office. Our design professionals have the experience to help you determine the products and design that will work best for you, in the colors and lighting of your surroundings. Linwood's sells first quality designer fabrics, custom upholstered furniture, custom window treatments, wall and floor coverings, bedding, lighting and accessories. 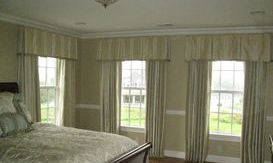 And, because we have our own professional drapery workroom, your project will truly be one of a kind. We work in Massachusetts and Florida, and will gladly furnish references upon request. Browse our website, if you have any comments or questions, please feel free to contact us.